Picture in your mind a calm pool of water. Now drop a pebble into the middle of that pool. Can you see the rings as they form and circle outward? Those rings are like the realms of social influence that we all experience in life. 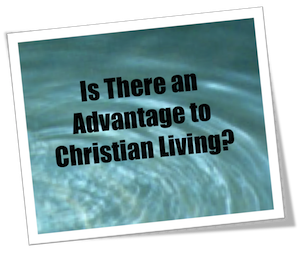 Q: Is there an advantage to Christian living? In order to pursue answers for this very important question we have organized the information on this website around the following five circles of social interaction: Individual, Family, Church, Community, Country. "Can a Christian know for sure they are saved?" Can the Bible Be Trusted? "Part 1"
Difficult Doctrines: "Introduction, 2 Timothy 2:15"
"Blasphemy of the Holy Spirit, Mark 3:20-30"
"Predestination, Romans 8 & Ephesians 1"
"Head Coverings, 1 Corinthians 11:1-15"
"Should Christian Women Teach Baptized Boys? Luke 2:49-52"
"Was Cornelius Saved Before Baptism?" "Does God still speak beyond the written word?" "Faithfulness: Characteristic of the Holy Spirit"
"Fruit of the Spirit: How can I know if I'm maturing in Christ?" "Is being a good person enough to save me?" "Is There A God? Biblical Evidence"
"Joy: Characteristic of the Holy Spirit"
"Kindness & Goodness: Characteristics of the Holy Spirit"
"Patience: Characteristic of the Holy Spirit"
"Peace: Characteristic of the Holy Spirit"
"Pickles, The Problem of Sin, and Personal Responsibility"
"What does a person have to do to be saved?" "What is a Holy Spirit partnership?" What Is Truth? : Part 1 -"The North Star"
Part 2 - "The Sacred Origins"
"Why is it important for Christians to be disciplined?" "How do I deal with intrusive in-laws?" "How can family life show us God's realm?" "How important are the marriage vows to God?" "If I Only Had a Heart"
"We One!" Marriage Challenge: "Marriage Memo 1"
"Why is it Important for the man to be the provider?" "Why is it important for boys to be shown how to become men?" Blessed Assurance: "1 John 1 Introduction"
"1 John 1:1 Jesus - Word of Life"
"1 John 1:2 Jesus - Eternal Life"
"1 John 1:3 Fellowship With the Father and the Son"
"1 John 1:4 Complete Joy"
"1 John 1:5 God is Light"
"1 John 1:6 Fellowship with Light"
"1 John 1:7 Walk In or Out of the Light"
"1 John 1:8 Formula for Assurance (Part 1): Honesty"
"1 John 1:9 Formula for Assurance (Part 2): Confession"
"1 John 1:10 Formula for Assurance (Part 3): Application"
"1 John 1 Blessed Assurance Review"
"Does the Bible really condemn homosexuality?" Evolution of Reformed Theology: "When Calvinism is Applied - Part 1"
"When Calvinism is Applied - Part 2"
"When Calvinism is Applied - Part 3"
"When Calvinism is Applied - Part 4"
Fellowship of the Rings: "Christians Unite! But At What Cost? - Part 1"
"Christians Unite! But At What Cost? - Part 2"
"Christians Unite! But At What Cost? - Part 3"
Gentle Jesus? Not Always! : "Introduction"
"How can we identify a true messenger of God?" "It's Time to Act! "1 - Facilitator of Social Ills"
"2 - Drain the Swamp"
"3 - Doctrine of the Strait Gate"
Keep the Faith! Being an Observer 1: "Self-examination"
Keep the Faith! Being a Follower 1a: "Study"
3b: "Being in Awe of Him"
3c: "Express Feelings for Him"
Keep the Faith! Being a Leader - "Introduction"
"Conclusion: Becoming a Complete Christian"
Less Talk, More Action - "Part 1"
Predestination - Part 1: "What is the biblical definition of predestination?" Part 2: "Can we impact our own predestination?" Part 3: "How does predestination impact evangelism?" Part 4: "What about Romans 9?" "Questions for Calvin: Testing the T.U.L.I.P. of Calvinism"
Questions for Calvin: Testing the T.U.L.I.P. of Calvinism - "Introduction"
"T is for Total Depravity"
"U is for Unconditional Election"
"L is for Limited Atonement"
"I is for Irresistible Grace"
"P is for Perseverance of the Saints"
Redemption - Part 1: "Redemption's Restoration"
Thief on the Cross: "Introduction"
To Keep The Faith! Series: "Introduction"
"A Surgery at the Hands of Christ"
"A Healing from the Holy Spirit"
"Investment: Taking Ownership of Their Place Within the Church"
"Dependence: Developing Loyalty to the Spiritual Network"
"Expression: Celebrating Reverent, Relevant, Revealing Worship"
"Was water baptism replaced with Holy Spirit baptism?" "What are the keys to building a growing church?" "What is the best way to deal with church conflict?" "When Satan's 'But..." Gets in the Way"
Women Preachers? "Part 1 - Women Preachers?" "Part 2 - Women Teachers?" "Can a quiet person be evangelistic?" "How do I help my homosexual friend?" "What are some simple things I can do to show Christ in my community?" Best Thing We Can Do for America is Cleanse the Church! : "Illegal Aliens Among the Church"
Christians and Politics: Part 1 - "Condemned or Commanded?" Part 2 - "The Greatest Threat to God's Favor"
Part 3 - "It's Time to A.C.T.!" Christians Posting Rainbows - "Part 1: How Did We Get Here?" "Part 3: What Can We Do?" "Has God removed America's blessing?" Islam Series: Part 1 - "Radical Few or Faithful Minority?" Part 2 - "Barbaric Violence"
Part 3 - "Abused Women"
Part 4 - "Life-Sucking Legalism"
"Lost Passion for the Lost?" "Our Weekly Prayer for Nebuchadnezzar"
Preparing for Islam Series: "Introduction"
"Do We Worship the Same God?" "What Does Their Holy Book Teach? (Part 1)"
"What Does Their Holy Book Teach? (Part 2)"
"What is wrong with this generation?" "The Gentle Jesus? Not Always!" "Gentle Jesus, Not Always! : Politics and Religion in a Violent World"
"Predestination: Confronting Reformed Theology (Calvinism Repackaged)"
"Question for Calvin: Testing the T.U.L.I.P. of Calvinism"
"Serving a Loud World With a Quiet Life"
"These Are the Days of Jeremiah"